In keeping with our commitment to social responsibility, the NAPOCares Committee sponsors community outreach programs and annual events to spread NAPO members' unique knowledge of organizing and productivity. Programs include community outreach in the host city of the annual NAPO Conference. On October 1, 2017, NAPOCares kicked off with some exciting news: NAPOCares is now an ongoing, year-long initiative with no end in sight! The goal is to let the world know that NAPO cares and to show how NAPO members give back to communities each and every day. The NAPOCares Committee encourages all NAPO members to participate regardless of their specialties. NAPOCares highlights the efforts of NAPO members, NAPO Chapters, and NAPO Business Partners as they reach out to share the three “T’s” of social responsibility: Time, Treasures, and Talents. NAPOCares will be holding a fundraiser again this year during NAPO2019 in Fort Worth, Texas to support the Presbyterian Night Shelter in Fort Worth, Texas. The Presbyterian Night Shelter offers assistance to those in need by providing free access to a safe shelter and a warm meal. They also provide case management, employment help, counseling, housing assistance, and other programs. The campus includes a shelter that houses homeless adults, with separate facilities for families (women and their children), veterans and those with behavioral disabilities. 2 - Make a monetary donation directly to Presbyterian Night Shelter. NAPO members can donate via custom link. 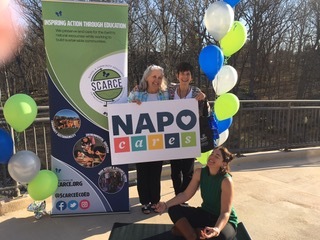 The NAPOCares Committee sponsored a fundraiser at the NAPO2018 Conference & Retreat in St. Charles, IL to benefit SCARCE (School & Community Assistance for Recycling and Composting Education). SCARCE is a nonprofit organization dedicated to protecting the environment. Since 1990, SCARCE has provided innovative, hands-on environmental programs that inspire members of the community to take action to reduce their impact on the planet. As a commitment to sustainability, they've also established collection projects to reuse and recycle items, keeping resources out of the landfill. Local NAPO members regularly bring items to SCARCE, knowing they will be put to great use. In addition to the monetary donations that NAPO members contributed to SCARCE to support their education/collection programs, NAPO National also donated a variety of new items from the conference (reusable bags, water bottles, storage containers, etc.,). This was above and beyond the 50 yoga mats NAPO donated which ultimately found their way to I Grow Chicago which works to empower the community of Englewood, one of Chicago's neighborhoods most impacted by poverty and violence. As part of their programs, I Grow Chicago teaches community yoga and mindfulness as an anti-violence tool. Both SCARCE and I Grow Chicago were extremely grateful for NAPO’s contributions. The NAPOCares Committee sponsored a collection drive onsite at the 2017 NAPO Conference in Pittsburgh to benefit The Education Partnership of Pittsburgh (www.theeducationpartnership.org). The Education Partnership is dedicated to addressing educational inequities by providing and enabling access to the tools and resources necessary to support teachers and enhance students' ability to learn and succeed. The School of Classroom Supply Initiative allows teachers to stock up on critically-needed supplies for their students throughout the course of the school year. Teachers come to the Resource Center to fill their shopping carts with over $1,200 in essential classroom supplies from pencils and markers to notebooks, calculators, glue sticks, and more - all at no cost. #NAPOCaresChallenge ran from September 1 to October 31, 2016. After helping clients eliminate unneeded items from their homes, NAPO members were invited to photograph those items designated for donation and post the photos to social media using the hashtag #NAPOCaresChallenge. 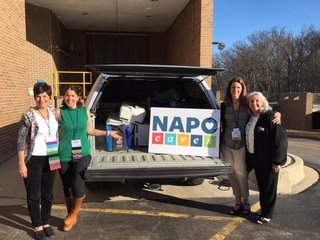 The NAPOCares Committee sponsored a collection drive onsite at the 2016 NAPO Conference in Atlanta to benefit a local charity called the Foster Care Support Foundation (FCSF). This was the first NAPOCares event. and it was a huge success. NAPO members brought a large quantity of items to donate and FCSF was very thankful.